Adam Delimkhanov extended Head of the Chechen Republic Ramzan Kadyrov's greetings to the head of state and said that Ramzan Kadyrov considers President Ilham Aliyev as his brother. Underlining that the Chechen people will never forget national leader of the Azerbaijani people Heydar Aliyev, Adam Delimkhanov recalled Heydar Aliyev's care and support for them in the most difficult times. He noted that the two countries' peoples enjoy unbreakable friendly and brotherly relations. 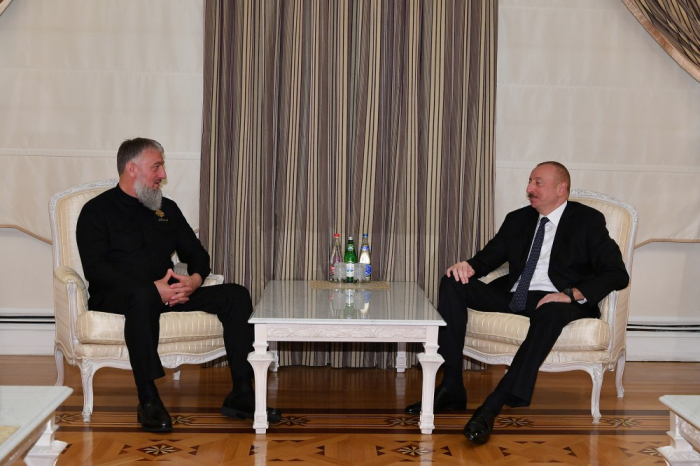 President Ilham Aliyev thanked for Head of the Chechen Republic Ramzan Kadyrov's greetings and asked the adviser to extend his greetings to Ramzan Kadyrov, adding that he and Ramzan Kadyrov are bound by ties of brotherhood. The head of state pointed out that the friendly and brotherly relations between Azerbaijani and Chechen peoples have deep historical roots and throughout the history these ties have always been strengthened. Recalling Ramzan Kadyrov's recent visit to Azerbaijan, President Ilham Aliyev stressed that Ramzan Kadyrov successfully continues the policy of leader of the Chechen people Haji Akhmad Kadyrov, hailing the establishment of stability and peace and implementation of large-scale construction work in Chechnya.